1Vice-president AES-Aquacultural Engineering Society 2010 IRIS, International Research Institute of Stavanger, 4068 Stavanger, Norway. ABSTRACT. Over the last 20 years, the Norwegian production of salmon and rainbow trout has increased by about 10% per year and will exceed 1 million MT in 2010. All on-growing after stocking in sea takes place in open cages in the fjords and along the coast, and the average cage volume has increased by about 300 times since the 1980's. Out of a total number of 4,000 cages more than 1,200 cages hold 20,000-60,000 m3. In 2005, the term 'maximum allowable biomass (MAB)' was introduced and limits the highest annual production to 65 tons per 1,000 m3 licensed volume. Generally, the increasing volume and deeper cages have made the control of the fish stock more challenging. Sea lice attacks, especially in South Norway, have represented a major problem over the last three years. Reduced growth, increased mortality and lice treatment leads to significant losses and extra costs for the industry. Some recent reports indicate that increased use of wrasses in the cages improved the situation in the summer 2010 compared to the previous year. Extensive vaccinating and strict regulations regarding handling, etc. usually result in effective protection against diseases, but still there may occur regional outbreaks of serious diseases, such as pancreas disease (PD) and infectious salmon anaemia (ISA). Attacks of sea lice and escape of salmon and trout from fish farms are considered to be among the main reasons for the strongly reduced wild stocks of sea trout and a reduced return of salmon spawners in the fjords and along the coast of southwest Norway. Keywords: salmon production, cage size, escape, diseases, sea lice, wild stocks, Norway. RESUMEN. Durante los últimos 20 anos, la producción de salmón y trucha arcoiris en Noruega se ha incrementado en un 10% al ano y sobrepasará 1 millón de toneladas para el 2010. Todo el proceso de "engorda" ocurre en balsas-jaulas emplazadas en los fiordos y zonas costeras. El volumen promedio de una balsa-jaula se ha incrementado en un 300% desde sus inicios en 1980. En un universo de 4,000 balsas-jaulas se tiene que más de 1.200 encierran un volumen de entre 20.000-60.000 m3. En el 2005, el término de "máxima biomasa permisible" o en inglés maximum allowable biomass (MAB) fue acunado y cuantita-tivamente limita la producción a un máximo anual de 65 tons métricas por cada 1.000 m3 de volumen de agua concesionado. Por lo general, el incremento del volumen y profundidad de las balsas-jaulas ha traído como consecuencia una mayor dificultad en el control y manipulación de los peces. Los ataques del piojo de mar o sea lice (en inglés), localizados especialmente en el Sur de Noruega, representan en los últimos tres anos uno de los principales problemas. Reducciones en el crecimiento, incremento en las mortalidades, y tratamientos para controlar la pulga de mar lideran las pérdidas económicas en la industria de acuicultura. Algunas publicaciones recientes indican que se ha incrementado el uso de tratamientos por medios biológicos utilizando wrasses que se alimentan de ectoparásitos en las balsas-jaulas mejorando la situación en el verano del 2010 en comparación al ano anterior. La vacunación masiva y una legislación estricta en relación a la manipulación de los peces, etc., han resultado usualmente en una protección efectiva en contra de las enfermedades, sin embargo aún persisten focos regionales de enfermedades muy serias, tales como la enfermedad del páncreas (pancreas disease, PD) y la anemia infecciosa del salmón (infectious salmon anaemia, ISA). Los ataques del piojo de mar, así como el escape de salmones y truchas desde los centros de cultivo de peces son considerados entre las principales razones de la fuerte disminución de la población natural de reproductores en los fiordos y en la zona costera del sur de Noruega. Keywords: producción de salmón, tamano de balsa, escapes, piojo de mar, población natural, Noruega. Norwegian aquaculture has been through a rapid development, not least in the new millennium. The industry has become more advanced considering biological aspects and engineering, and new potential aquaculture species in addition to salmonids are emerging. This progress has however brought up some serious challenges too which have to be thoroughly considered. This article is based on a presentation held at the III Aquaculture Congress in Vina del Mar, in November 2010. Over the last 15 years, the annual volume produced has increased about four times from 200,000 to more than 900,000 MT and is expected to exceed 1 million MT this year (2010). The salmon production constitutes about 90%, rainbow trout 7-8% and cod 2% (Fig. 1). Besides this, a smaller part of some 5,000 MT is accounted for by Arctic char, halibut and turbot. The average production per farm is ca. 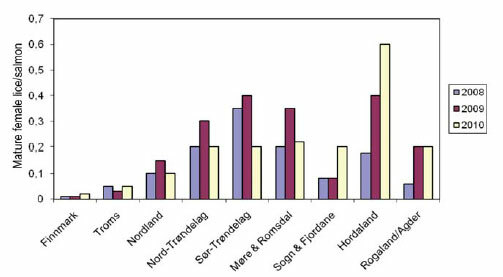 1000 MT year-1 considering as the total number of active licensed farms was 929 in 2007 (Statistics Norway, www.ssb.no). Figure 1. Annual production of salmon, trout and cod in Norway 1997-2009. Source: Statistics Norway (http://www.ssb.no). Figura 1. Producción anual de salmón, trucha y cod en Noruega 1997-2009. Fuente: Estadísticas Noruegas (http://www.ssb.no). The ownership structure of the industry has been through a revolution from a great number of companies only administering one or a few farms to a few large companies. Among these are Marine Harvest and Cermaq operating numerous fish farming activities in several countries. The production of salmonid smolt for stocking in the cage farms has been through a similar development: while a typical hatchery in 1985 produced 100,000-300,000 smolts of 30-50 g, the average production in 2006 was more than 1 million smolts of 100-200 g per hatchery, i.e. 20 times higher annual production in terms of biomass. The total production of smolt was about 300 million and the number of licensed hatcheries 228 in 2007 (Statistics Norway). A dramatic size increase of the cages has taken place; the shallow cages of a few 100 m3 dominating the industry back in the 1980's are now replaced by huge cage systems with 20-50 m net depths. The cage can have a maximum circumference of 157 m. The total number of cages is currently some 4,000 and out of this 1/3 have a total volume of more than 20,000 m3. 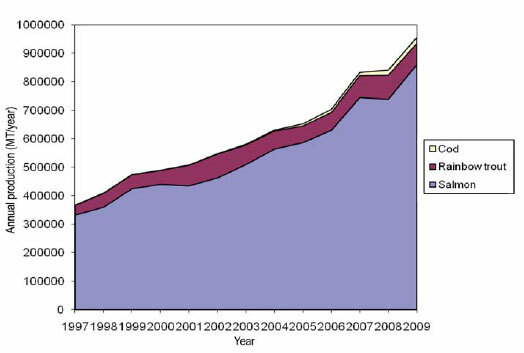 During the period 2005-2009, the total production volume was almost doubled from 37 to 67 million m3 (Norwegian Directorate for Fisheries, http://www.fiske-ridir.no). The previous cage volume and feed quantity limitations are repealed. Today, only the MAB, maximum allowable biomass, is left (Norway, Ministry of Fisheries and Coastal Affairs) MAB allows a production of 65 MT per 1,000 m3 licensed volume and a standard licence of 12,000 m3 thus permits 780 MT produced per year. More and more cage farms are moved from protected sites to more open, deeper localities intermittently affected by strong water current velocity, wind and waves. Current velocity of more than 0.5 m s-1 is not uncommon at such exposed cage localities. Consequently, there is a need for new and robust equipment and, not least, available technology for running control of the fish stock and the cages. Farm sites off the coast are deeper and the cage nets are 20-60 m deep. The visual control from the surface of a deep, large cage with a circumference of 160 m is only 0.2% of the total volume (Blaalid, 2008). Traditionally, steel framed cages have dominated in Southern Norway, while PVC frames have been more used in the northern parts. The PVC based farms are considered to be more resistant to rough weather conditions. An increasing number of cages are equipped with a submerged camera for surveillance of the fish stock. A sketch of such a system with successive motion vertically-horizontally is presented in Fig. 2. Vital conditions regarding the fish stock, such as appetite, possible health or lice problems, mortality rate, early warning of escape, etc. can be observed from the screen in the operation room in real-time. The behaviour of the fish will be compared to the environmental conditions, e.g. the preferred depth correlated to the temperature and oxygen profile. Current monitoring of water exchange and temperature - dissolved oxygen within the cages explains considerably the fish stock's conduct and not least, makes it possible to put into effect counter-measures. At high temperature and low oxygen concentration feeding may fortify the situation. Figure 2. System for control of fish stock and environmental conditions in cages. Courtesy: Orbit AquaCam, Norway. 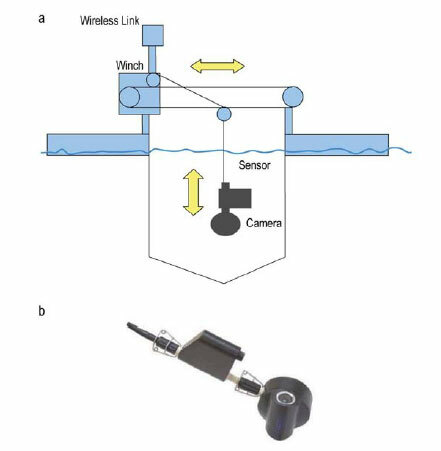 a) Sketch of a movable vertical-horizontal camera with sensor station, b) camera with Orbit-800 Sensor Station for monitoring of DO, temperature and salinity. Figura 2. Sistema para control de peces y de condiciones ambientales en las balsas-jaulas. Cortesía: Orbit AquaCam, Noruega. a) Dibujo de una cámara con movilidad vertical-horizontal en una estación de sensores, b) cámara con el Sensor de Estación Orbit-800 para el monitoreo de oxígeno disuelto, temperatura y salinidad. Use of current meters may indicate essential different conditions of the water exchange at the surface and in deeper layers at a cage site (Fig. 3). 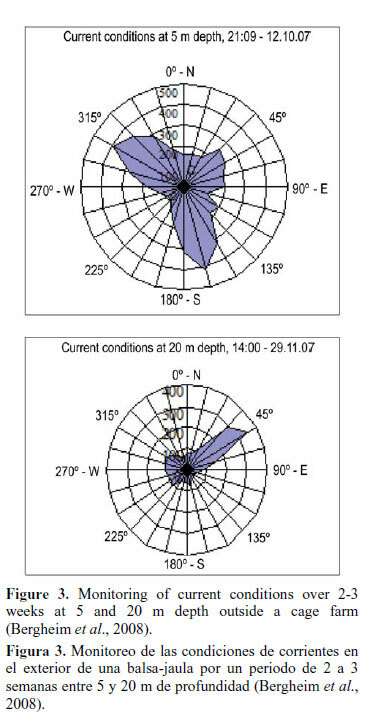 A fluctuating tidal based current in a NW-SE direction was demonstrated at 5 m depth compared to current in a stable NE direction at 20 m depth. In both layers, the average velocity was ca. 2 cm s-1 (min-max: 0-10 cm). Thus, the 'carrying capacity' was about the same in the water column in terms of supply of oxygen and removal of excretion products. The dissolved oxygen concentration (DO) at this farm stocked with 3-5 kg m-3 was reduced 10-15% of saturation at 8-9°C in the cages due to the respiration of the cod. As much as 2030% lower DO was measured a few times at 25-40 m depth compared to at the surface (Bergheim et al., 2008). The primary reason was lower DO saturation from outside and higher fish density below 20 m deep. The debate about alternative technology to open cages has reached a new era. Different problems linked to open systems described in this paper are the basis for the discussion. Such alternatives are closed floating cages supported pumped water from deeper layers and added oxygen or air (Skaar & Bodvin, 1993). Land-based recirculating systems (RAS) are another possible trend and tests are being performed (e.g. Johnsen et al., 2003). Intensified production of salmonids in on-shore systems (RAS) from brood stock to harvest combining freshwater and sea water is an emerging alternative (Wolters et al., 2008). An advanced research facility involving all these processes has been completed at Sunndalsora in NW Norway (Terjesen et al., 2008). Obviously, studies on non-anadromous species may also be performed in such systems. Most disease problems along the Norwegian coast are caused by virus. The frequency of proved and suspected outbreaks of dominating diseases and Infectious Salmon Anaemia (ISA) is presented in Table 1. ISA has attracted special attention due to the huge damaging effects on the salmon industry in Chile and on the Faroe Islands. As a result, an international expert group has been established to enhance the knowledge base. Pancreas Disease (PD) hit 75 farm sites last year and the disease seems to move north as some incidents have been proved in Northern Norway over the last years. The actions against PD include synchronized fallowing, splitting of generations, reduced moving between sites, control of infection, and vaccination (Fiskehelserapporten, 2009). Heart and Skeleton Muscle Inflammation (HSMI) is a frequent and fatal disease first detected in one farm in 1999. This disease is associated with infection with Piscine Reovirus (PRV), first identified in 2010 (B. Jensen, pers. comm. ; Palacios et al., 2010). Infectious Pancreas Disease (IPN) incidents were reported from altogether 53 hatcheries and 170 cage farms in 2009, the highest number ever reported. The mortality may reach high levels especially in hatcheries and survivors often demonstrate reduced growth ('IPN-losers'). Bacterial diseases, such as Vibriosis, Cold-water Vibriosis and Furunculosis, are generally effectively controlled by vaccines. PGI or Proliferative Gill Inflammation has been detected in salmon farms since sine the 1980's (Fiskehelserapporten, 2009). Table 1. Number of cage sites in Norway with outbreaks of virus diseases 2004-2009: Infectious Salmon Anaemia (ISA), Pancreas Disease (PD), Heart and Skeleton Muscle Inflammation (HSMI) and Infectious Pancreas Necrosis (IPN). Source: Fiskehelserapporten (2009). Tabla 1. Número de concesiones de balsas-jaulas en Noruega con focos de enfermedades virales 2004-2009: Anemia Infecciosa del Salmón (ISA, siglas en inglés), Inflamación del corazón y músculo esquelético (HSMI, de siglas en inglés) y Necrosis Pancreática Infecciosa (IPN, de siglas en inglés). Fuente: Fiskehelserapporten (2009). The predominant parasite problem in Norwegian aquaculture is caused by sea lice (Lepeophtheirus salmonis), a natural parasite of both salmon and sea trout. Whelan (2010) has reviewed the well-known effects of sea lice attacks: impacts on the host's skin include epithelium loss, bleeding, increased mucus discharge, altered mucus biochemistry, tissue necrosis and consequent loss of physical and microbial protective function. Host fish have reduced appetite, growth and food conversion efficiency, and the stress and wounds expose fish to secondary infections. Changes to the host's blood include anaemia, reduced lymphocytes, ion imbalance and elevated cortisol. These changes indicate a stressed and weakened host, with reduced osmoregulatory and respiratory ability and impaired immuno competence. There is also increasing evidence that the louse is vector for spreading of PD (T.E. B0rresen, pers. comm.). Over the last years, the average number of lice has increased in south Norway (Fig. 4). Especially in great salmon producing regions in the mid and west part of the country the lice require extra action. Commonly used treatment chemicals administered in feed, emamectin benzoate and pyrethroids, demons-trate reduced effect (Fiskehelserapporten, 2009). A close relationship between frequent usage of these medicines and high lice numbers has been observed in several regions. In general, the lice will sooner or later develop resistance against all medicines used. Figure 4. Sea lice problems in cage farms along the Norwegian coast in July 2008-2010. Unit: Mean number of sexually mature female sea lice per salmon. Source: (http://www.lusedata.no). Figura 4. Problemas de infestación con pulga de mar en centros de balsas-jaulas a lo largo de la costa de Noruega en julio 2008-2010. Unidad: número promedio de hembras de pulga de mar sexualmente maduras por salmón. Fuente: (http://www.lusedata.no). - usage of medicines in tarpaulin enclosed cages, and - increased more and more stocking of wrasses in the cages Medical treatment in enclosed large volumes is challenging, not least to get a stable effectual concentration of the drug and to avoid dissolved oxygen (DO) dropping below stressful levels. The lowest acceptable DO concentration is considered to be 6-7 mg L-1 or approx. 70% of saturation (Crampton et al., 2003). Stocking of cleaner-fish, goldsinny and ballan wrasse, at a ratio of about 1:100 in the cages may be an efficient method attempt to control the lice population (Kvenseth et al., 2003). In order to reduce the drug usage and improve the control, more farms are substituting chemicals with stocking of cleaner-fish (Fig. 5). The trend continues and according to the last reports the wrasse-stocked farms amount now to more than 60% of the total. Some recent reports indicate that increased use of wrasses in the cages improved the situation in the summer of 2010 compared to the previous year. Figure 5. 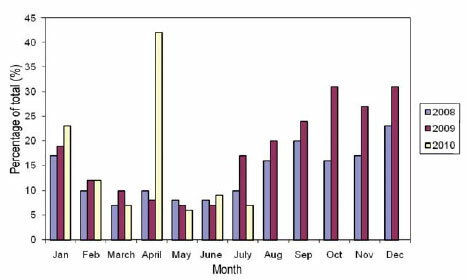 Usage of wrasse for sea lice control in Norwegian cage farms January 2008-July 2010. Source: (www.lusedata.no). Figura 5. Uso de control biológico con wrasse de la pulga de mar en centros de balsas-jaulas en Noruega de enero 2008 a julio 2010. Fuente: (www.lusedata.no). Breeding programs for lice resistant salmon have been discussed. However, this might result in the development of sea lice which are more virulent against wild salmon. Sea lice from regions influenced by many fish farms seem to be more harmful to wild stocks compared to lice from southeast Norway without aquaculture (http://www.kyst.no). Alternative production systems, such as submerged cages (Dempster et al., 2009), and extended usage of artificial light (Juell & Fosseidengen, 2004), might be useful attempts to keep the fish stock away from the 'sea lice zone' towards the surface. Catch and abundance of wild Atlantic salmon have declined dramatically in the North Atlantic over the last 20-30 years. The reported catches of salmon in 1980 of ca. 10,000 tons were reduced to below 2,000 tons in 2007 (ICES, 2008). About half of the total is caught in the rivers and along the Norwegian coast (Hansen et al., 2006). In terms of estimated number of returning spawners to the rivers in Norway a total of h approx. 900,000 in 1985 has been reduced to 300,000400,000 in 2007 (Hansen et al., 2008). There are numerous causes of the reduced salmon population, such as overexploitation, river pollution and acid rain, but effects from fish farming are considered as significant in many regions. Hybridisation between wild and farmed salmon is considered a main threat to salmon in freshwater, while sea lice are a problem in many marine areas (Hansen et al., 2008). Ford & Myers (2008) compared marine survival of wild salmonids in areas with farming to adjacent areas without farms in Scotland, Ireland and in Atlantic Pacific Canada. Through a meta-analysis of existing data, they showed a reduction in survival of Atlantic salmon, sea trout and Pacific salmon. In many cases the reductions in survival and abundance are greater than 50%. 7. In summary, the survival rate and migratory pattern are dependent on the time and life stage at escape. In addition, there are incidental escapes of farmed rainbow trout and marine fish. The Directorate of Fisheries (2010) reports 133,000 rainbow trout, 175,000 cod and 16,000 halibut escaped in 2009. Costello (2009) carried out a very detailed review of the impacts of sea lice from salmon farms on wild salmonids in Europe and North America. He concluded that there was compelling evidence that lice from farms are a significant cause of mortality in nearby wild fish populations. Sea trout dwell in the fjord systems before ascending the rivers and this cycle makes this species especially vulnerable to sea lice infestations. In June 2010, the average number of lice on returning sea trout was 60 per individual in a fjord system in SW Norway characterised by high aquaculture activity (Institute of Marine Research, 2010). April (FHL, 2010). These efforts are primarily initiated to protect the wild salmon and sea trout stocks and the final goal is to reduce the average number of lice to 0.1 per salmon in the cages. Per July 2010, the frequency of sea lice was below this level in the northern part (Nordland, Finnmark) but higher in the southern part of the country (Fig. 4). The author would like to thank Dr. Germán Merino of Universidad Católica del Norte, Coquimbo, Chile for adding Spanish text and giving valuable advices. Thanks are also due to my colleagues, Drs. Paivi Teivianen-Lœdre and Emily Lyng, for comments and language corrections when preparing this paper. Not least, I strongly appreciate the two reviewers improving the manuscript before publishing. Received: 13 January 2011; Accepted: 15 March 2012.